Originally printed on January 10, 2019 in the Shropshire Star. GREGORY Rita Gladys Peacefully in hospital in her sleep on December 25, 2018 of Oakwood, Vesey Court, Wellington formerly of Ridgeway, High Ercall. Beloved Wife of George. Dear Mother of Julie and John, Mother-in-law of Alan and Emma and Grandmother of Steven and Ryan. 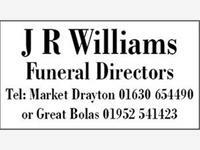 Funeral Service, 12 noon, on Wednesday, January 16, 2019, at All Hallows Church, Rowton, followed by Interment in the Churchyard. Family flowers only but donations if so desired for the Renal Unit at the Princess Royal Hospital, Telford, for which purpose a collection plate will be provided in Church.